We don’t tend to think of men and jewels at the same time, except for the stereotype of the hesitant and terrified young man headed for a diamond seller. Aiming for a symbol of a lifetime of wedded bliss, he buys a diamond instead of a far more ‘useful’ extra car, a drone, or an exciting weekend in Vegas. I’ve encountered lots of men who have wedding rings, but don’t wear them. “I’m not used to it,” is the usual explanation, or perhaps, “I’m not a jewellery person.” I’ve also heard some men say, “It interferes with my work.” Rubbish. Old-school ‘madmen’ masculinity allowed for jewels. Tie bars, tie tacks, cufflinks, and pinkie rings decorated the ‘manly man’ of the 1950s and 1960s, and remained popular into the 1970s. By the 1980s, the escalating price of gold led to growth in heavy neck chains, ID bracelets, and big knuckle-duster rings that screamed, “Look how well I’m doing!” The essence of ‘hard masculinity,’ Mr. T, wore what was reported to be 14.5 kg (32 lb) of gold chains around his neck during that time. 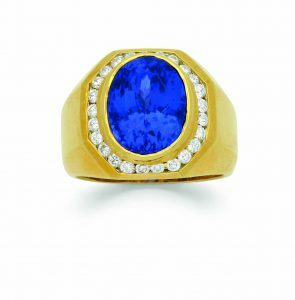 A men’s tanzanite, diamond, and gold ring. Men have accessorized with jewels for thousands of years. The child king, Tutankhamun, lived more than 3000 years ago and was decked out virtually head to toe in fabulous jewels. Mind you, we’ve only seen his jewels worn in death, but I’m sure he was fairly well adorned in life, too. Kings have always tended to have greater access to jewels than the rest of us, but we non-royals have still done pretty nicely over the centuries. Historically, men’s jewels have been decorative items, representative of social status, employment, rank in military or religious life, prosperity, and—to a lesser extent—personal taste. There has always been an aspect of the practical purpose to men’s jewellery, but it has always been at least partly decorative. For instance, a soldier wears bright gold-coloured buttons, medals, bars, and badges, usually at least plated in precious metal. Japanese samurai also had highly ornate elements to their swords, a testament to the Japanese metalsmith’s art and really jewellery for the busy soldier. In the 21st century, brooches have been appearing on men’s jacket lapels. An art deco diamond and platinum brooch, circa 1930. The earring was the territory of the pirate and sailor for many years, but really made the transition to the urban world in the 1980s, when it became a symbol of sexual orientation before being quickly adopted into the mainstream for men. At one point, I had one brother with (if I remember correctly) 12 earrings, and another brother with an earring in each ear. I myself continue to wear one in one ear. I also had an employer in Australia who was very conservative, yet still allowed male employees to wear stud earrings (but not hoops) even back in the 1980s. A diamond and gold brooch. Men in the religious sphere famously wear large rings. Roman Catholic bishops wear rings with amethyst, a purple gem representing love and truth in the Christian church. Bishops, archbishops, and popes all wear rings symbolic of their respective rank and position in the religious hierarchy. Throughout history, men have worn rings to represent their position in our society. Aristocrats, royalty, and landowners have used rings engraved with their family crests to impress a seal on documents. By the 19th century, the industrial revolution had brought huge social change, giving more people the ability to afford decorative items such as jewellery. We’ve all seen images of the Victorian gentleman industrialist with a gold chain straining across his generous belly, and the carved carnelian seal fob on the chain to formalize correspondence. Many of us still have our grandfathers’ pocket watches and chains, seized up in the back of a drawer. While many of the jewels I’ve mentioned so far have a practical or symbolic purpose, all are still decorative and ornamental. Jewels are items of beauty that may be functional, but are mostly interesting, beautiful, and curious, providing pleasure to the user or the viewer. Men still focus on the practical. While we don’t carry the traditional pocket watch around these days, most men carry a modern ‘pocket watch’ in the form of a smartphone. Despite the use of the phone for simple time telling, a wristwatch is still a central element of a man’s jewellery wardrobe. Though a wristwatch is a useful item, it’s really more a decorative piece than ever; we wear it to accessorize more than to tell time. Men match the colour of their watches to their belt buckles or bracelets, or the strap to their shoes and belts. We also choose giant, oversized watches, mainly because they make a great visual impact in our accessorizing. We likely also wear large watches because failing eyesight and vanity brings about a need for a larger dial. The large watch has replaced the pocket watch and chain as a sign of success. The wristwatch is still a central element of men’s jewellery wardrobes. Men’s stainless steel ‘L’Evolution Moonphase 8 Days’ wristwatch by Blackpain. The brooch was mainly seen as a women’s jewel through the first half of the 20th century. By the 1960s, changes in the textiles we wore caused us to likewise change the jewels we wore. The wide-ranging adoption of lighter, flimsier synthetic fibres meant clothes would likely be damaged by brooches, so we stopped using them. In the 21st century, however, brooches have been appearing on men’s jacket lapels. 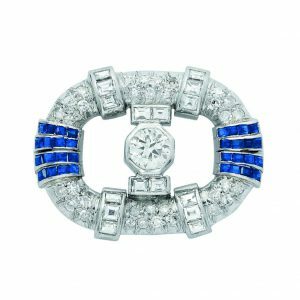 A while ago, I went to a jewellery industry event that was a ‘brooch party’—everyone wore a favourite brooch, including all the men. A brooch is a real statement jewel. Its form is fairly unlimited, so there’s no finger to fit, nor a necessary shape or direction. Designers and jewellers use the form to state who they are or who the client is. It’s a jewel that has no practical purpose; it really is a statement of personality and taste. The lines blur—men and women often equally wear similar forms of jewels. The heavy gold chains of the 1980s have disappeared from men’s necks and wrists, and have been replaced by bracelets and necklaces, often simple and given as gifts by partners. Couples are increasingly purchasing matching jewels beyond the traditional wedding rings; matching bracelets and earrings are not uncommon. It has always been a challenge for jewellers to break the gender barrier, men being traditionally reluctant to wear jewels. Despite a long history of men ornamenting themselves with decorative accessories, the average male consumer has traditionally seen jewels as somewhat frivolous and unnecessary. It’s still true the traditional jeweller has a limited offering of male-oriented jewels, but with our gender stereotypes shifting, tastes in jewellery also change. 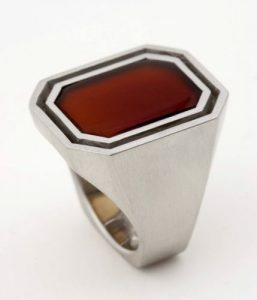 Designers and jewellers who provide custom work are increasingly finding customers looking for special designs built for men. Men are buying for themselves or for their partners, and women are buying for their partners in turn. 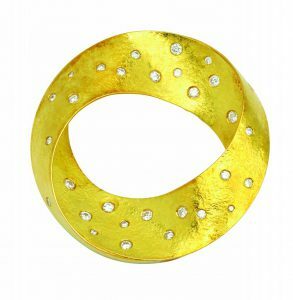 Women buying jewels for men is a big change in the market, where traditionally men buy for women. We’ve really moved on from the bad old days, and men are increasingly accessorizing with jewels.